News yesterday that the NZTA have confirmed they’ll add noise barriers to the motorway through Ellerslie. Ellerslie residents suffering from motorway noise are in for relief with confirmation new barriers will be built along a section of State Highway 1. The NZ Transport Agency is also investigating noise barriers for other sections of urban motorways in Auckland. Work on the Ellerslie barriers will begin by the middle of the year, Transport Minister Simon Bridges said. NZTA could not say exactly where the Ellerslie barriers will be built, as designs are still to be finalised. However, residents on Findlay and Hewson Streets, near the Ellerslie Train Station, have been lobbying for action on motorway noise. The Ellerslie Residents Association (ERA) has pushed for sound barriers, saying noise has increased as traffic worsens and since the completion of the fourth northbound lane. Wow an extra lane made noise worse, whoever would’ve thought. It’s good that the NZTA are finally going to mitigate some of the impacts the motorway has on the surrounding area. They did add some short noise barriers between the train station and the motorway as part of the recent motorway widening but I’m not a regular user of the station so I’m keen to hear the thoughts of those who are as to the impact they have or haven’t had. This isn’t the only place that could really do with some noise barriers. The articles say they’re looking at other areas too but really, shouldn’t all urban motorways have at least sound barriers as even the most basic mitigation. It’s interesting that this was announced by Simon Bridges and not the NZTA, highlighting that this was a political decision. This is no surprise as we’ve seen in other situations that the NZTA will often try and do as little as possible to mitigate the significant impacts of urban motorways and tend to only do so when they are either upgrading the road or if really forced to do so. Radio NZ reports that the barriers will cost $6 million. I wonder how much it would cost to properly mitigate the noise along the rest of the motorway network. Where are the locations you think should be next on the list for noise barriers? Agree, I was amazed how much difference a bit of glass made to the noise on the platform, much quieter now. Nice of them to make it glass as well, so we can still see the traffic crawling along. I bet the glass barriers (which really do work) bounce some of the noise over at that townhouse development. I recall reading that barriers should have a few degrees angle so as to bounce the noise upward. Don’t think the Ellerslie ones do have that angle but it may be hard to tell by eye. AT/NZTA should open up the Ellerslie motorway barriers for advertisements. I’d rather look at ads than look a carpark. Went to check out this development recently, they really need to put up noise barriers. Also a shade sail or 5 would be extremely welcome until the trees grow. About 10 years ago when it was Transit I wrote to them suggesting that when the wire fence between the Greenlane Railway station and the Motorway finally fell over,which it was in places, that they consider a sound wall as a replacement. Their response was that it was not in the consent to do so. The issues are compounded at Greenlane in that when the motorway is noisy such as wet days the adjoining railway station PA automatically turns up the volume based on the ambient noise level to a point that nearby residents is like living in a stadium when announcements are made. Noise barriers should definitely be part of any motorway design. I live close to the motorway in Greenlane. The noise from trucks and motorcycles, in particular, really stands out. Just one more way fossil-fuel fuel engines degrade the environment. A motorway full of electric cars and trucks would be a very different thing. The barriers are just one more cost imposed by bad fuel choices. Agreed, noise barriers are standard fare on motorways and main arterials globally. Steve, when you bought there did you have any clue that there was a motorway over the fence? Let’s assume that he did. And that the open home was during a standard, not abnormally low, traffic day. We should also assume that, by preference, he’d rather live somewhere else that is further from the motorway, ceteris paribus. Or, maybe, this strange implicit “you chose to live there, mate” point misses the thrust… i.e. that noise pollution is another cost of bad fuel choices, and here’s an anecdote I [Steve] know to help demonstrate that noise pollution is a Thing. That is, the apparent meaning of your post, taka-ite, has an unfair view of agency /and/ an irrational reading of Steve’s post. Or, maybe, /I’m/ misreading what you wrote, in which case it really should be fleshed out some more because as it stands it gives itself naturally to the just described interpretation rather than whatever it was you were trying to say. I find this latter point implausible (I must assume I can’t read, and that you can’t write), but it remains a possibility. Yes! I bought when there were still diesel commuter trains they roared every 10-15 mins at peak times. The move to electric changed that, as I knew it would. Much better. Sound barriers on the motorway will make it better again. I was thinking of putting up my own “sound barrier”, but it was rightly pointed out to me that 50m away from the motorway would be completely ineffective. They need to be right at the edge of it. Most noise from any modern car comes from the tyres on the road. I have seen Nissan leafs and a Tesla model s go past me at over 80 km and you can’t tell the difference between them and the Honda accord and BMW following them. They sound just the same. I don’t understand why we build motorways out in the open hea in NZ I think every motorway should have tall sound barrier’s or be built in a trench. Which will also help slow drivers down as people tend to drive slower in confined spaces. The noise of tyres on the road is white noise, no problems with it. Trucks and their engine brakes, loud motorcycles and boy races exhausts are the biggest problem. Barriers reduce the noise slighly, but NZTA would save a lot of money if they banned engine braking, loud motorbikes and exhausts that produce more noise than what they should. I live more than 1km from the motorway, but when the wind blows towards my house, or on a quiet night, I can definitely hear the motorway noise clearly. I would not hear EV noise, I can guarantee you that. Yes, and that is especially true inside. → not sure whose jurisdiction that is. Auckland is an odd exception here, it’s the only town or city centre I have encountered in NZ where engine braking isn’t banned. Along state highways, even small villages have engine braking restrictions. A bit similarly, NZ is the only country I’ve ever been where those after-market exhausts are so prevalent. You can live in Belgium for 10 years without ever encountering one. The same with extremely loud motorcycles, other countries appear more successful than NZ in enforcing exhaust noise limits. Motorbike noise is especially aggressive and invasive. But that seems to be the point for the rider; it seems they are compensating for some inadequacies elsewhere in their lives…. I can’t understand how these machines are legal, but then I also can’t understand why we don’t test and regulate the worst exhaust polluters either….? Motorbikes vary hugely in noise level and reason for buying. A Ducatti road bike won’t be any louder than an average BMW sedan, whereas a moped on city streets will be louder than any other than a hoon’s bike. As for the low blow of “must be compensating” – Come on… At my last role, we had approx 50 people in my area. At lease a dozen were motorcyclists. Only *one* had a loud bike, the rest were similar noise to an average car. *Every single one* of the motorcyclists drove responsibly and with concern to how vulnerable the vehicle made them. Each one chose to use a motorbike because the fuel was cheap and traffic congestion less relevant (lane splitting being legal, if somewhat risky). I spent ~20 years in various IT roles, the people around me were all IT professionals and most very well paid. They certainly didn’t conform to your stereotype. FWIW, yes you can get a motorbike for $6k, however one manager paid $120k for his bike and most paid nearer to $20k. The problem is those few really loud ones. They produce, what, 130 or 140 dB? There’s nothing else comparable to that noise level, even trucks using engine brakes are not nearly that loud. Mopeds or scooters, not even close. Cars and even buses are almost silent in comparison. I’ll probably never understand how anyone can be as ridiculously inconsiderate as driving one of those through a city. Let’s be straight here. The problem are Harleys with straight pipes. My bike is not quiet but if I get an Harley close by I can’t even hear my engine, and I’m sitting on it. This is encouraging news. Will be interesting to see the eventual design in terms of where, how tall and whether they are on both sides. The noise from the motorway certainly carries across large areas of Ellerslie and the One Tree Hill area on the other side. I vaguely remember noise walls being built by the Botanic gardens a few years ago improving things in the gardens but reflecting noise back the other way and making it worse in parts of Manurewa on the other side. The residents that complained the barrier reflected and increased the noise level on their side opposite the botanical gardens imagined it, or were subject to season variations in wind patterns that caused the volume to increase when the wall went up co-incidentally. Before and after the barrier was removed the noise level was measured on the opposite side and found there was a negligible *increase* in noise once the barriers were removed (and a massive increase in noise in the botanical gardens). I don’t understand why the government hasn’t required noise barriers to be retrofitted the full length of auckland urban motorway network. It’s inhumane not to. When are they going to do it to the botanic garden? The noise just makes the garden very unpleasant and not peaceful. They were removed by the ARC many years ago now after years of legal challenges by the residents of Hill park with the support (from memory) of the MCC. The erecting of sound barriers should raise a RED flag this was once done by the old Auckland Regional Council at the botanic gardens with a bad outcome of causing reflected noise up into residential properties with little benefit to the garden visitors. The problem was the surface was flat steel insulated panels causing the problems fitted to only one side of the motorway and after a court case was ripped down at great taxpayer expense. The sound pressure waves caused by motorway operation is fairly complex but building walls is not the remedy. There is a product or design process that will be of some benefit which uses a retaining wall type structure filled with fractured rock that absorbs the sound and it is diverted in all sorts of angles and dissipated with in to limit the outgoing energy. Its not cheep but is used extensively overseas and requites no long-term repair work. However it should be implemented on BOTH sides of the motorway and some times fitted with a partial hood a top the barrier to stop the sound waves wafting over the top these walls are sometimes over 7 meters high and considered a visual impairment as well. These fractured rock 7 metre high walls on both sides of the motorway sure look like an above-ground attempt to put the motorway in a trench..
Waterview – huge towering ramps which will broadcast sound across Waterview and Pt Chev, NZTA refused to install them saying noise was no worse than all the other places with no barriers…. 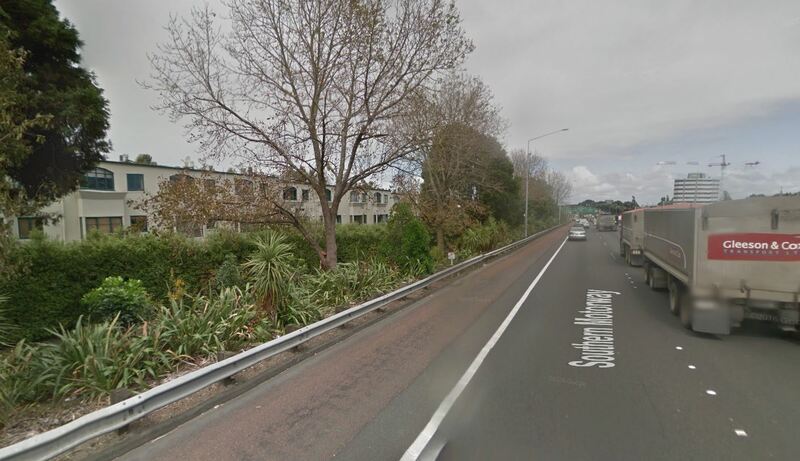 On the issue of community severence: the 4.8km of SH1 from the Ellerslie interchange to St. Marks Road has 8 pedestrian crossing points over or under the motorway, with an average spacing of 530 metres (the longest stretch without a crossing is about 900 metres). Contrast that with the 4.2km of SH16 from Newton Road west to Carrington Road with 4 intervening pedestrian crossing points at an average spacing of 840 metres (longest stretch without a crossing is about 1,440 metres). So there is considerable variation in the degree of severence around the motorway network – I am sure that there are worse examples. Talk of just closing more than a few of our level crossings could compound this issue of major transport routes serving as barriers between different communities – a curious paradox since transport by definition is about providing convenient connections for its users. On the Shore we have 970m between Wairau Road and Tristram Avenue, then 1150m to Sunnynook Road, then 1260m to Sunset Road. Additionally, Wairau Road is a rather unpleasant underpass for pedestrians, and Tristram Avenue is even worse with only a narrow footpath on one side, and no footpath at all on the other. Agree that motorway severance is a big deal which needs more attention. In Ellerslie it also pays to look south – thete are no safe pedestrian or cycle croaaings for about 1.3 km from Ellerslie Station to Penrose Road. (The motorway interchange roundabout is totally unsafe for anyone not in/on a motor vehicle). If the underpass connection aeound the back of the Transpower substation from Gavin St to McNab St were reopened the situation would be improved, but it has fallen into a bureaucratic black hole. More low hanging fruit for Harriet to look into maybe…? If you mean the one at Ellerslie Panmure highway, this entire thing between Great South Road and Main Highway, roundabout and all, is off-limits for anyone not in a motor vehicle. There’s no walking / no cycling traffic signs on both sides. Yes, that’s exactly what I mean. My point is that terrible motorway severance exists all over Auckland. It’s about time that the NZTA starts taking the initiative to make amends for decades of poor design and planning. The Heralds John Roughan was very aroused by motorways in last Saturdays edition, waxing lyrical about the beauty and splendour of our almost completed motorway system provided to us lucky proles by his magmanimous party. Funny but he failed to mention the horrendous noise or the carbon monoxide pouring òff them. Anyway the residents closest to the action need not worry, lane 5 is calling. Ellerslie is a real bottle neck! in my experience double glazing doesnt really work at blocking out motorway noise, maybe triple glazing. Sadly there’s plenty of apartments without ventilation out there, which will remain quite miserable places to live as long as we have this absurd tolerance for road noise. Even with single glazing, opening or closing a window makes a very noticeable difference. The trick is actually to have both, double glazing with one hush pane. Having two glass panes of different thicknesses is very effective at blocking a broad range of noise frequencies, in conjunction with a broader gap with filler gas of a different density than air (i.e. argon). For example, you can have one that is tuned to block low level hum of road noise and the second for the frequencies of the human voice. Unfortunately most double glazing is designed for thermal properties with two identical panes and a relatively narrow gap, unless you specify noise blocking as a requirement. Also careful design of frames and walls helps a lot, otherwise noise can ‘leak’ around the window rather than transmit through it. And about $5m would fix the now closed Wairoa-Gisborne railway line…..
Have your bone with the massive wasteful projects that NZTA progresses such as the $2-3billion EW Link, not small scale projects such as this that should have been done to begin with and which make a huge difference to liveability in Auckland. Off topic: i see the East West link has been notified to the EPA this week. With TOES having been tamed it seems there is no organised opposition – the cunning of selecting a route that doesn’t threaten anyone’s house prices. I’m not getting the feeling that a Basin Reserve style upset is on the cards. Will it matter a damn if I make a submission? No. Roads are a political matter in New Zealand, rather than a technical or environmental one. Your energies are best directed at political solutions. I use ellerslie station – always impressed at how much noise is kept out with such a low barrier, but also wondered where sound might be bouncing over to. Off topic – Anzac ave is a canyon – the noise from modified exhausts is incredible – triple glazing would not keep that out! There need to be stronger controls on all vehicle noise and not just along motorways. Noise has significant adverse effects on health. It keeps young kids and shiftworkers awake. And it’s very annoying to be on a footpath chatting to family or friends and to have to stop talking everytime someone requires attention with a noisy engine and exhaust. With modern motors this is purely for show. And who gives a damn about what NZTA writes in their traffic code? What matters is which parts are actually enforced. You can rent an apartment on Hobson Street for a few months and see (and hear) for yourself. There’s apartments right across the police station. Things which are tolerated: extremely loud exhausts, queueing across intersections and pedestrian crossings, parking on the footpath, racing. I’ll be very surprised if I ever see a cop pulling someone over for a too loud exhaust.